Memorial services were held at 10 a.m. today at First United Methodist Church for Vernon R. Haldeman of Artesia, “Boss Man” to many who knew him. Haldeman, 85, passed away in the early hours of Saturday, March 18, 2017, at Artesia General Hospital. Interment followed the services at Woodbine Cemetery. Monty Leavell and David Prell officiated at the services. Pallbearers were Steve Lewis, Charles Haldeman, Royce Pearson, Owen Lyles, Chuck Morgan, Harold Green, Mike Welch and Murnie Cauhape. Honorary pallbearers were Phillip Baumgardner, Clarence Connor, Sonny Watts, Tom Brown, Ramon Ibanez, Mack Chase, Mel Runyan, Joel Bell, Jeff Bell, Ken Aaron, Bill Mershon, Oscar Sanchez, Jimmy Moreau, Steve Haines and Rance Miles. Boss Man, a true Artesian, was born Nov. 9, 1931, in Artesia, in the house in which he presently lived, to W.T. and Vernie (Campbell) Haldeman. He graduated from Artesia High School in 1951 and, on July 22, 1951, married Virginia Green. Vernon attended Eastern New Mexico University in Portales and Texas Western (now UTEP) in El Paso, Texas, graduating in 1955 with a degree in biology. Post-graduation, he returned to the family farm to farm with his father. During the next 60 years, he touched many lives and blessed the community with his exceptional passion and ability for producing fresh produce, alfalfa and cotton. The Haldeman Farms’ produce stand opened in the late 1970s, where Vernon and his family grew and sold his famous green chile, squash, watermelon, cantaloupe, tomatoes, and other well-requested produce. Haldeman Farms employed many people in and around the Artesia area. Along with the farm, he raised cattle, sheep, horses and goats throughout his lifetime; he loved all animals, and they equally loved him. Vernon was an extraordinary athlete who held the high school state record in the high jump for numerous years and was named an All-District and All-State running back for the Artesia Bulldogs. He attended college on a track scholarship and also played college football. He continued to share his athletic ability with his family by participating in their weekly volleyball games on the farm. He was an avid mentor, not only to his family and friends but also to his family’s friends and employees. 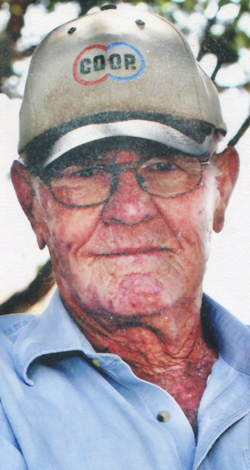 Vernon was an ornery, intelligent, gentle and caring man who thoroughly enjoyed hunting, fishing, travelling, cooking, and watching the Artesia Bulldogs and Dallas Cowboys. He was a member of the Elks Lodge and Masonic Lodge. Most importantly, Vernon was a genuine example of a provider who greatly loved his wife, children, grandchildren and great-grandchildren in ways that will always be cherished and admired. His legacy will live on through his family, friends, and all whom he treated like his own. Survivors include his wife, Virginia, of the family home; son Richard Haldeman and wife Silvia; daughters Sarah Gromatzky and husband Rick, and Susan Chandler and husband Baron; grandchildren Jessica Parker, Brandon and Suzzy Haldeman, Kelsey and Jason Starnes, and Brooke and Clark Driver; great-grandchildren Croix and Cason Haldeman, and Jase, Atley and soon-to-be Lawson Starnes; and numerous nieces and nephews. He was preceded in death by his parents, W.T. and Vernie Haldeman; his mother- and father-in-law, F.L. and Elizabeth Green; son Daniel Haldeman; infant son Robert Haldeman; brothers Victor and Vance Haldeman; and sister Vivian Tidwell. Memorial contributions may be made to the Elks Lodge No. 1717 of Artesia Scholarship Fund, P.O. Box 1271, Artesia, N.M., 88211-1271; or Paws & Claws of Artesia, P.O. Box 807, Artesia, N.M., 88211-0807.